Outside of being a Brazilian jiu jitsu guru, most MMA fans have very little knowledge about Jon Olav Einemo. Here’s one thing we do know about the Octagon rookie, he specifically requested Shane Carwin to welcome him to the big leagues. 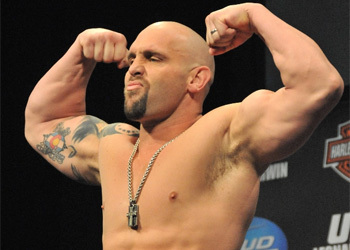 Carwin has been on the mend from a January back surgery, but has been penciled in for UFC 131 without an opponent for quite some time. UFC president Dana White finally issued Carwin his next assignment on Wednesday. Although the 36-year-old is coming off a submission loss to Brock Lesnar, the former interim heavyweight champ owns a dominant 12-1 resume and should be extra motivated since he’s coming off his only professional blemish. All of Carwin’s wins came via devastating finish. Props to Olav Einemo for wanting to start his UFC career off with a bang. Since he’s jumping into a new pond, why not go after one of its biggest and baddest fish? The event is scheduled to take place June 11th inside the Rogers Arena in Vancouver, British Columbia, Canada. The pay-per-view broadcast is expected to feature a heavyweight top contender scrap between the aforementioned Lesnar and Junior dos Santos. “I got a call from my manager yesterday saying that this Jon Olav Einemo had asked to fight me. I was waiting on the Russow Maddsen outcome but I guess the UFC liked this match up. For me I just want an opponent. I [think] Jon has a great background and is someone we will take very seriously. I have had a long lay off and I am excited to have an opponent. I am a competitor and I train to compete at the highest levels and against the best. I want to get a shot at that belt, I am going to do my best to make sure nothing or no one stands in my way. I am excited to be on the UFC 131 card in Vancouver.